Perfluorinated compounds (PFCs) are a group of compounds that are highly resistant to degradation which allows them to accumulate in water sources, particularly those used for consumption. One of the biggest challenges when extracting these compounds is minimizing interferences and opportunities for contamination during sample preparation and analysis. This webcast reviews EPA Method 537 on how to demonstrate lack of system contamination and sample-to-sample carryover. 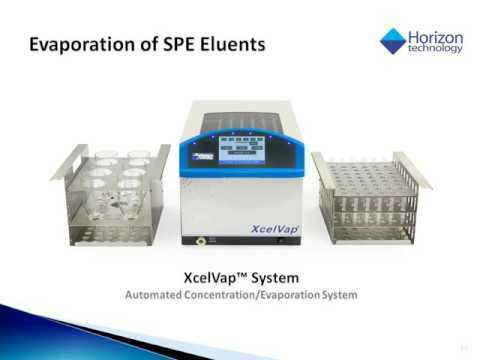 Data is presented for the extraction of up to 24 PFC compounds on an automated solid phase extraction system in multiple water matrices, following the requirements in EPA Method 537. What does this mean to you? Updated methods for a variety of analytes in wastewater are now available, including 608.3 (organochlorine pesticides), 624.1 (volatiles), and 625.1 (semivolatile). 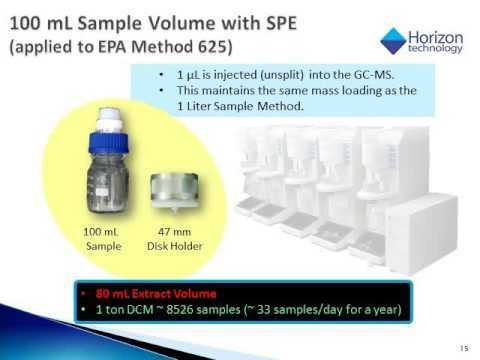 Disk solid phase extraction has been used with method 608 for more than 20 years, now you can use it for method 625.1, expanding the methods you run using SPE to all major EPA programs. 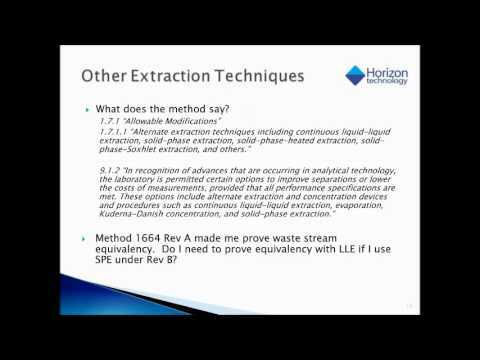 This webcast discusses the use of solid phase extraction (SPE) in environmental methodology. The impact of the Method Update Rule (MUR) is discussed along with the requirements for use of SPE in the wastewater program outlined. 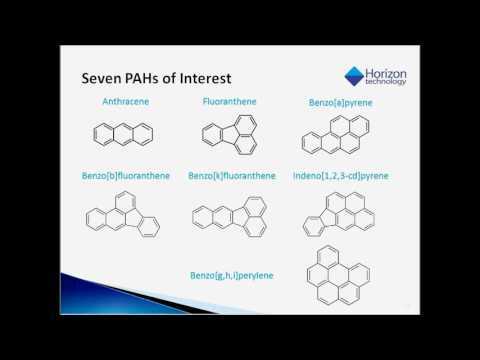 The full data package generated by Horizon Technology to ensure compliance with the new validation requirements is discussed and the data summarized. 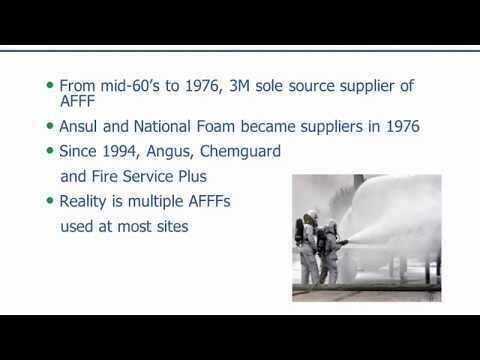 Perfluorinated and Polyfluorinated Chemicals in the Environment - What's the Big Deal? Perfluorinated and polyfluorinated chemicals are increasingly of concern because of their ubiquitous presence in the environment and concern over the potential impact on human health. This presentation will outline current regulations and the types of testing that can be performed. It will explore the methods presently available as well as those that may be developed in future. 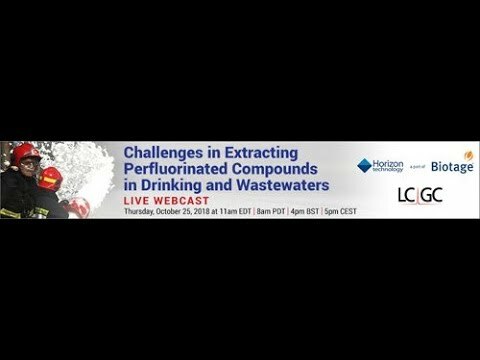 Watch this webinar to learn about: Current regulations Testing techniques and methods Analysis of drinking water. 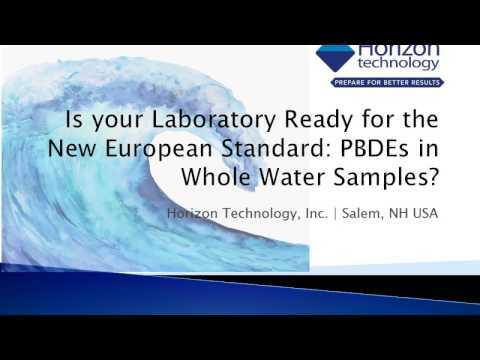 Presented by: Charles J. Neslund, Scientific Officer, Eurofins Lancaster Laboratories Environmental, LLC and Zoe A. Grosser, PhD., Marketing Director, Horizon Technology, Inc.
Is your Laboratory Ready for the New European Standard: PBDEs in Whole Water Samples? This webcast will discuss the definition, history and utility of a general, simple-to-use hydrocarbon in water measurement. The US EPA Method 1664, N-Hexane Extractable Material (Oil and Grease) in water will be discussed and proper use will be outlined. he kinds of questions that come up in an audit situation and how to prepare for them will provide the main portion of the discussion. Sample preparation is a key part of the analytical process, contributing to reproducibility and accuracy in the final results. The evaporation/concentration step can be achieved with various technologies, including heat, vacuum, and blow-down. 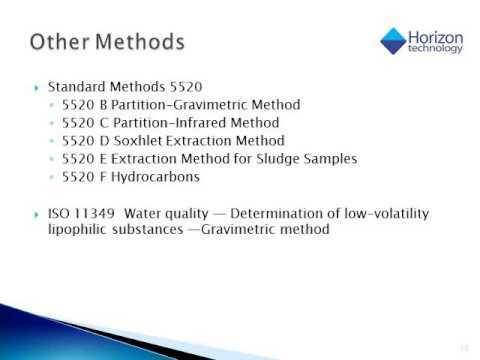 We will examine the parameters that go into each of these choices and describe criteria to consider in matching the sample to the technique. Presented by Marc Hamel and John Siira, Horizon Technology. Food safety is an increasingly important topic for our global food supply. Quality data are critical to ensuring safe food. 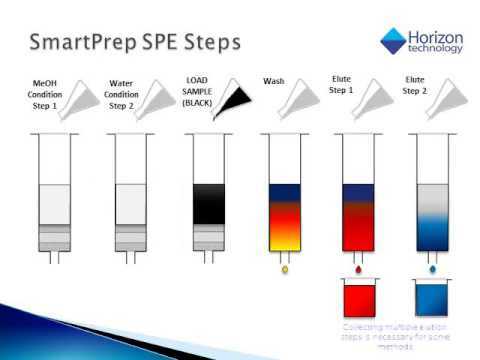 Although many advances in the sensitivity and applications of analytical techniques have occurred, often sample prep has lagged behind. 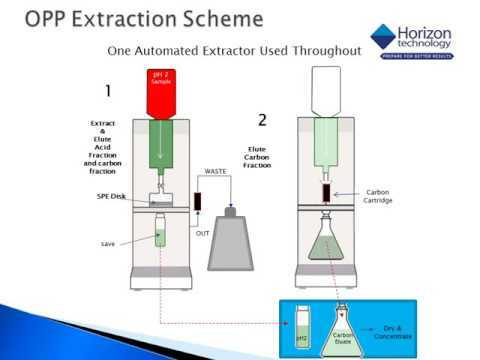 Solid-Phase extraction (SPE) has shown utility in both clean-up and concentration of food extracts. 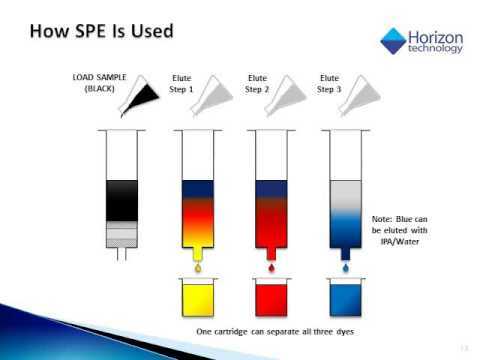 How do you move into automation of cartridge SPE? Improved accuracy and precision with less hands-on time for a variety of food safety analyses will show the utility of this approach. Recent changes have caused laboratories to take a look at air emissions, mostly arising from solvent evaporation of organic extracts. Through Title V and State Implementation Plans up to 10 tons of chlorinated solvent and up to 25 tons total of solvent may be emitted with a valid permit. For extremely small emitters, no permit is required if they are not at risk of exceeding the limit. Presented by Bill Jones. 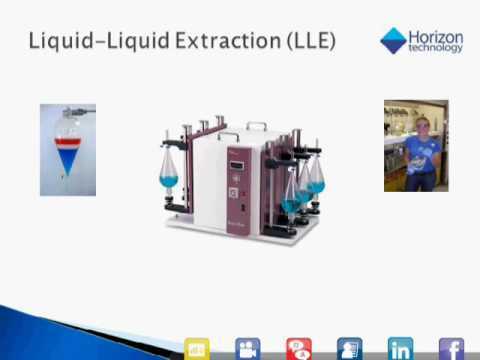 Solid Phase Extraction (SPE) is a well known and useful technique for the extraction of organic compounds from aqueous samples. This paper will address both the chemical and physical issues, and present data which shows that with proper use, that SPE can successfully be used to process typical environmental samples, effectively, efficiently, and provide comparable or better data than achieved now with conventional liquid/liquid extraction techniques. Presented by David Gallagher, Horizon Technology. When health concerns about chlorinated solvents become an issue, typical extraction methods must be reconsidered to substitute a solvent that will provide efficiency and be compatible with the analytical technique. The considerations required in method development will be examined and data shown to validate the developed method. 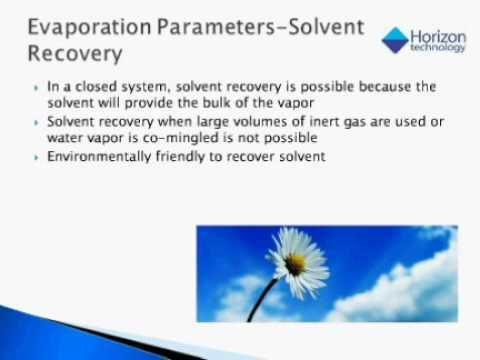 Presented by Jim Fenster, Horizon Technology. Pesticide contamination is a continuing issue around the world, requiring careful measurement and monitoring over time. 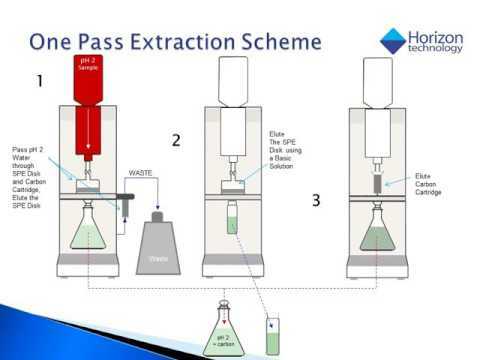 Solid phase extraction can provide a convenient extraction procedure, for a full suite of analytes. Method development and extraction optimization for more water-soluble compounds will be explored. Presented by Jim Fenster, Horizon Technology. 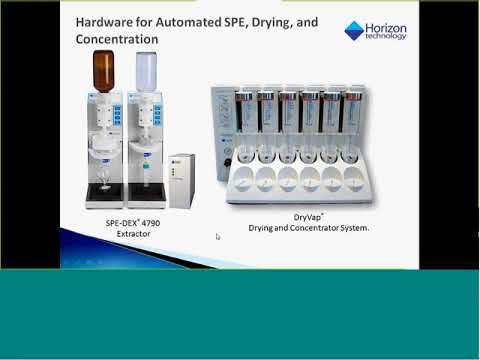 Part of a discussion panel, Horizon Technology describes the importance of sample preparation and the options to automate this important step in the analtyical process. Optimization of extraction, extract drying, and evaporation / concentration can provide better results with less labor and materials costs. Presented by Zoe Grosser, Horizon Technology and three other panelists. Solid phase extraction (SPE) has been around for more than 40 years and has improved to the point that it is well characterized and understood. The maturity of the technology allows for wider use and less method development when applied to a new analytical situation. 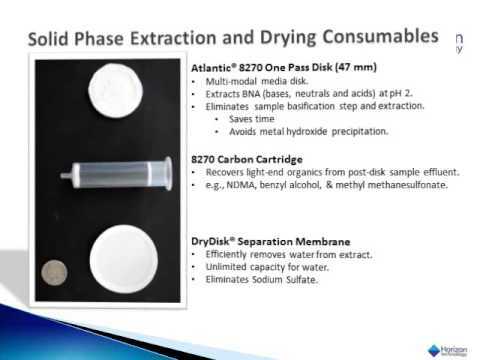 Solid phase extraction has been used in a variety of market segments, such as environmental, food, and pharamaceutical. This webcast will discuss the progress in SPE development, current uses, mechanisms and methodology currently in use. Automating a manual method is illustrated with a simple color separation using black dye. 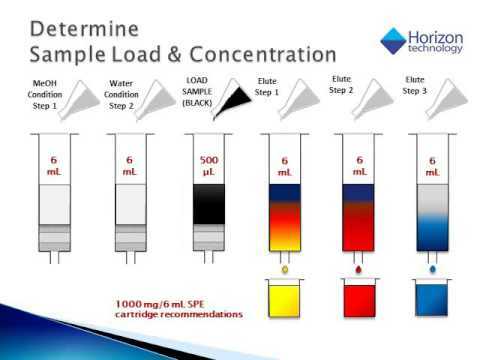 The steps to take in developing and optimizing transfer of an established manual cartridge method are described. Pesticides are used on agricultural commodities and are monitored to ensure safety. This presentation describes the development of an automated method for the manual method required by the Alcohol and Tobacco Tax and Trade Bureau. Oil and Grease analysis is a simple measurement that can indicate pollution or help ensure the health of a treatment plant. The development of the methodology, use, and variations in selected countries will be described. Method 625 is one of the few environmental methods without the use of solid phase extraction (SPE) included. 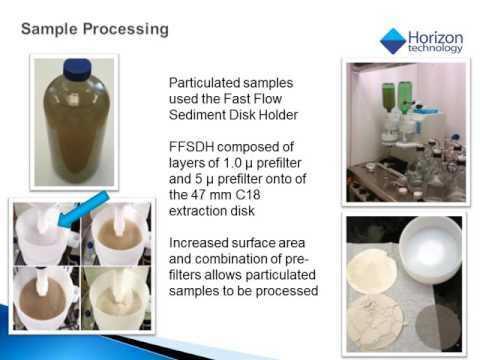 This presentation describes testing, in preparation for a round robin, demonstrating the excellent performance of SPE for synthetic wastewater spiked with a full suite of organic compounds. Toni, Hofhine, Horizon Technology, was invited by the University of Wisconsin - Madison Chemistry Department to participate with Dr. Pamela Doolittle, Dr. Rob McClain, and Dr. Martha Vestling to introduce sample preparation instrumentation as it relates to industry use to a grad student class.